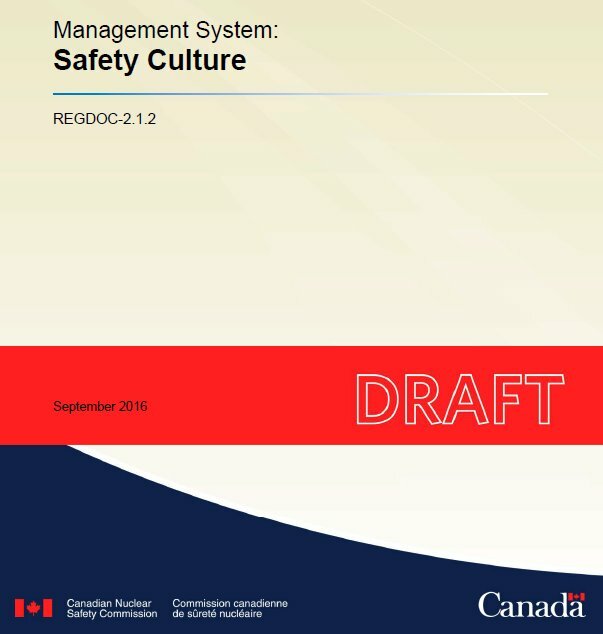 The Canadian Nuclear Safety Commission (CNSC) has published a draft regulatory document REGDOC-2.1.2, “Safety Culture” for comment* The REGDOC will be a requirement for nuclear power plants and provide guidance for other nuclear entities and activities. Section 2 specifies five characteristics of a healthy SC: Safety is a clearly recognized value, accountability for safety is clear, a learning organization is built around safety, safety is integrated into all activities in the organization, and a safety leadership process exists in the organization. For each characteristic, the document lists observable indicators. Sections 3 and 4 describe how licensees should perform SC assessments. Specifically, assessments should be empirical, valid, practical and functional. Each of these three characteristics is fleshed out with relevant criteria. The document goes on to discuss the mechanics of performing assessments: developing a communications strategy, defining the assessment framework, selecting team members, planning and conducting assessments, developing findings and recommendations, writing reports, etc. The introduction to the SC characteristics says “The highest level of governing documentation should make safety the utmost priority – overriding the demands of production and project schedules . . .” (p. 4) The specific SC indicators include “Timely decisions are made that reflect the value and relative priority placed on safety.” (ibid.) “Workers are involved in risk assessment and decision-making processes.” (p. 5) “A proactive and long-term approach to safety is demonstrated in decision making.” (p. 6) We would have liked a more explicit treatment of safety-production-cost goal conflict but what the CNSC has included is OK. This topic is only mentioned in a table of SC maturity model indicators that is in an appendix to the REGDOC. The links between SC and other important organizational attributes must be inferred from the observable indicators. There is no discussion of the interrelationship between SC and other important organizational attributes, e.g., the safety conscious work environment, management’s commitment to safety, or workers’ trust in management to do the right thing. The discussion is limited to workers. What about senior management compensation and incentives? How much are senior managers paid, if anything, for establishing and maintaining a healthy SC? The discussion on performing assessments refers several times to a SC maturity model that is appended to the REGDOC. The model has three stages of organizational maturity—requirement driven, goal driven and continually improving, along with specific observable behaviors associated with each stage. The model can be used to “describe and interpret the organization’s safety culture, . . .” (p. 10) Nowhere does the REGDOC explicitly state that stage 3 (a continually improving organization) is the desired configuration. This is a glaring omission in the REGDOC. Bottom line: If you keep up with IAEA’s SC-related publications, you don’t need to look at this draft REGDOC which adds zero value to our appreciation or understanding of SC. 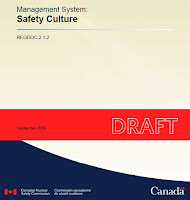 * Canadian Nuclear Safety Commission, draft regulatory document REGDOC-2.1.2, “Safety Culture” (Sept. 2016). The CNSC is accepting public comments on the document until Jan. 31, 2017.